Here is my newest build if people want to try testing it out. If you want to help test you'll need to sign up on our forum so you can report bugs. I finally had a chance to fully test the app at a tournament. But I ran into a problem with blue on blue match-ups not calculating scores properly. other then that it worked pretty good. The blue on blue match-ups have been fixed. I've also removed the blue on blue option for the setup. the app will automatically determine if blue on blue needs to happen. If it does it will still only do blue on blue match-ups as a last resort. I went to a weighted scoring only. Seeing how the New Zealand nationals were weighted. No matter what kind of options you take for scoring you will end up with a score out of 100. So, when sportsmanship is set to 20% it really means 20%. Not 20% of your total sports score, so it could end up being 4.5% or 45% of your overall score. I've really been able to clean scoring up because of this. There is now a check box for judges. What this means that if this is checked, judges will decide paint score. 1-6 judges will be able to give their scores for all players. The Fav %, is for the % of score that player votes will count for. Whether you use judges or player scoring every player can vote for their favorite paint. The % is part of your overall 100% but cannot go over your max Historic weight. This will be subtracted from our Historic weight. So if you set Historic to 20% and Favorite % to 5%. 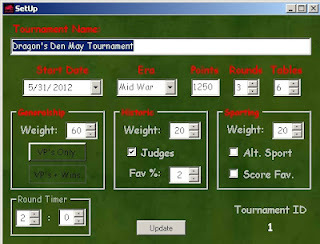 Your Judging will be worth 15% and player pics will be worth 5%, for a total of 20% for Historic. If you have 18 players in your tournament, all 18 players would have to judge your army as the best in order to get the FULL 5%. Even if you make it 2%, this seems to really eliminate ties. If you select 0% for Fav %, obviously none will be counted to your overall score. However those votes will still be added together for a Favorite opponent award. Similarly there is a Score Fav check box. If this box is checked. 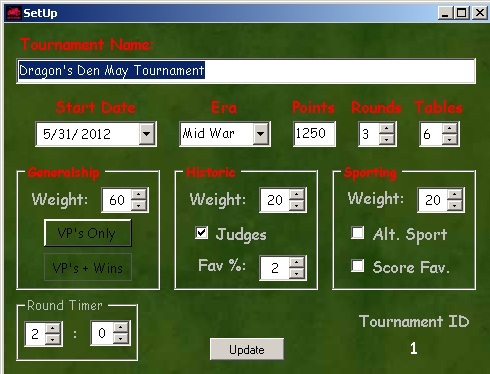 players can vote on a favorite opponent for an extra point that will count towards your overall score. You will only be able to vote for players you play against If the box is unchecked no Favorite opponent votes will count towards your overall score, however like Historic those votes will still count towards a favorite opponent award. Favorite opponent votes are also used in tiebreakers, if people didn't know that. The next major add on will be to add groups into match-ups. I've been meaning to add this in for a while, but at this tournament I tested at, a bunch of out of town players ended up playing each other. This is what the groups will be for. You create a group for players that don't' want to play each other. Maybe you have several clubs. Just create a group for each and assign players to those groups. Then those players won't play each other for at least the first round. Any way, we are closing in on 6 months for this project and I've done very little painting. If you want your say before this gets released, please sign up and do some testing for me.